Beware, if you are thinking of starting a blog it may change your life in ways you least expect. I had no idea when I set up Just Add Attitude that writing it would pique an interest in grammar and punctuation. In an earlier post I talked about using Lynn Truss’s book, Eats, Shoots & Leaves to help improve my shaky grasp of the rules of punctuation. However I am still wondering if the sentences I string together are grammatical correct, I am still struggling with the comma and I am still trying to come to grips with the correct use of the semicolon. More help is now to hand as I have just bought a book which I hope will aid the befuddled part of my brain in charge of not-mangling-the-language. 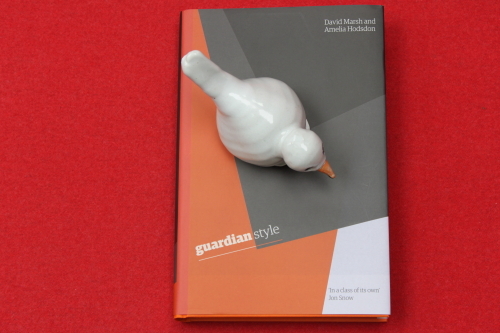 Guardian Style by David Marsh and Amelia Hodsdon is the style bible which journalist at The Guardian and The Observer refer to when writing copy. There is a fourteen-page run through basic grammar and punctuation rules at the front of the book and the rest of the handbook is an alphabetical guide to correct usage e.g. ‘alibi – being somewhere else; not synonymous with excuse’, spelling, abbreviations and punctuation. It is witty and erudite; a book for dipping into or referring to, rather than a cover to cover read. I bought the book but the guide is available free on The Guardian website click here. (when you get there use the letters of the alphabet at the top of the page to search further). Improving my grammar and punctuation is a work in progress; this month’s tasks are mastering the ‘that or which’ rule and trying to use the semicolon correctly. Please feel free to correct mistakes. Wonderful! We all still have so much to learn in order to communicate better. What a delight to see someone else busy working toward that end as well. I’m ridiculously fond of abusing the language for my own entertainment, but at the same time, I know full well that there’s not the remotest chance of anyone else being entertained by it if it strays so far from “the law” as to be completely unintelligible! I enjoy reading your bog because you achieve such a happy medium between the playful and the “proper”. Thanks Kathryn for your kind comment about the blog. Blogging is strange sometimes it leads you down unexpected byways. You say you are fond of abusing the language -pushing the boundaries maybe and creating something different. I have always thought I was pretty good at spelling and grammar, but once I started blogging I learned to keep a dictionary and grammar book beside me. I am envious I am not good at spelling and I have to rely heavily on spellcheck.